South Yorkshire's "Augusta", the only Dr. Alister Mackenzie designed golf course in South Yorkshire is enjoying continual play this winter despite a clay based soil structure, a sloping location and torrential rain. Sitwell Park Golf Club, near Rotherham has a 95 year old parkland course situated on the side of a hill. "Go down six to twelve inches and you'll meet solid clay," says Secretary Steve Bell. "Over the years the whole course had become compacted and was suffering from water logging with standing water on the greens. Last spring we'd hired a large machine to aerate the fairways but it's no good taking a tractor on the greens." Head Greenkeeper Chris Colton suggested the club try one metre deep, compressed air de-compaction treatment and Steve contacted Terrain Aeration who arrived at the end of March with one of the company's Airforce Scamper Terralift machines. "They worked on the four lowest greens which were worst affected, inserting the probe through the top soil into the clay and injecting air between 200 and 400 psi to open up the subsoil," Steve continues. Dried, milled seaweed was injected on the final air blast, which swells when wet and keeps the fractures and fissures open. Following treatment the fifth hole was brought into play for the first time in four months. "We were on it within seven days," Steve reports. "The other treated greens that we'd been on and off all winter were open all the time. The surface water had gone and the turf had lost its sponginess." Having played the course all summer, Sitwell Park Golf Club decided to recall Terrain Aeration to treat all the greens but two. "We've asked the company to price up these two remaining greens so that when they're in the area they can come and do them," Steve explains. 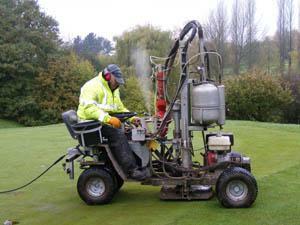 "The subsequent condition of the treated greens has been outstanding. Two thirds of them are the original Alister Mackenzie designs and we like to think of ourselves as custodians of his course. We have our own 'Amen Corner', which we call the 'Jungle' in the 4th, 5th, 6th and 7th holes. A short par four, followed by a long par three, then a short par four and another long par three."